A while back, Thunderbird Real Food Bars company was generous enough to send me a variety of their bars to try. So here you finally have it: a review of these bars! It took me quite a while to get through my stash because I’m not going to lie, I was savoring each flavor! Let’s talk ingredients. One word: simple. 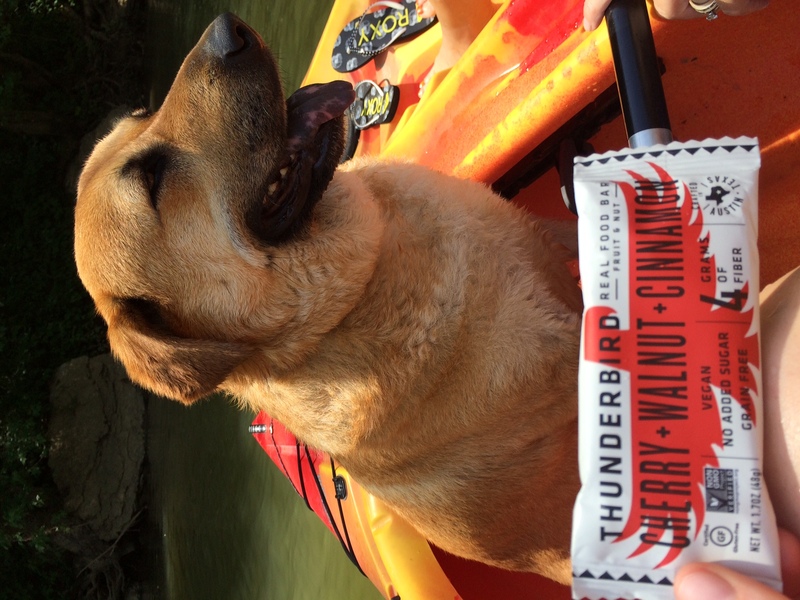 Thunderbird Real Food Bars are made with 100% all natural ingredients, such as nuts, dates, a variety of fruits, seeds, and spices. Spices were my favorite part of those bars. For example, their Cherry Walnut Cinnamon bar was one of my favorites- the hint of cinnamon combined with sweet cherry balanced out the taste perfectly. It also helps that Thunderbird uses some of my favorite, less commonly seen ingredients for their bars, such as lemon, papaya, pistachios, and turmeric. 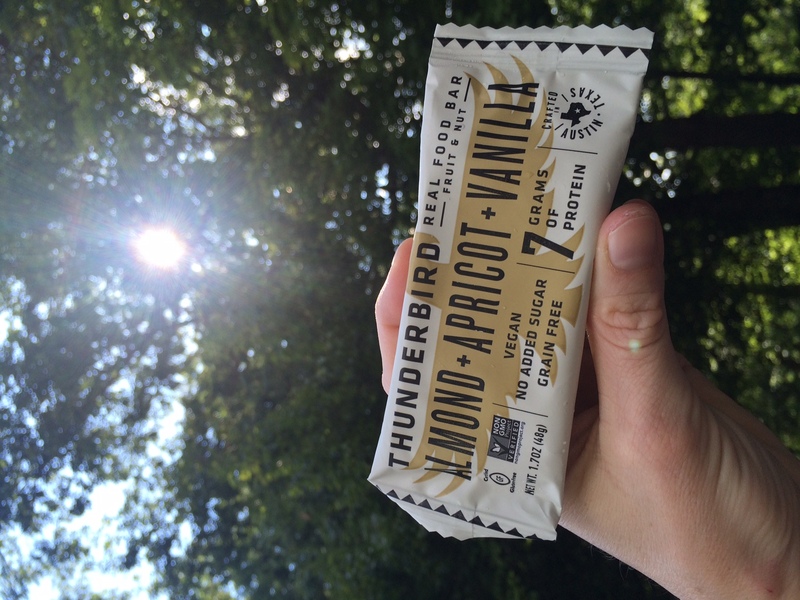 Thunderbird Real Food Bars are just that- real food. No added grains, protein whey, fats, etc. What you see on the label is what you get, and the nutrition comes simply from a few ingredients. I also appreciated that there’s nothing listed in the ingredients that I could not pronounce! I loved that these bars were convenient and portable. If you’re like me, often on the go and outdoors, you’ve probably discovered that many popular “protein bars” don’t do well with heat or being roughed around too much. Like being stashed in your car for an emergency snack break. Or being squished under a heavy water bottle in a hiking bag. You get the picture. I’m always snacking, so I took these bars all over the place with me- on kayak trips, hiking, in suitcases on trips, even to work in my scrub pocket. These babies don’t melt or crumble. Winning. It all goes back to what they are made of. You won’t find any fake chocolate chips melting to your wrapper and making your snack time look like that of a toddler. 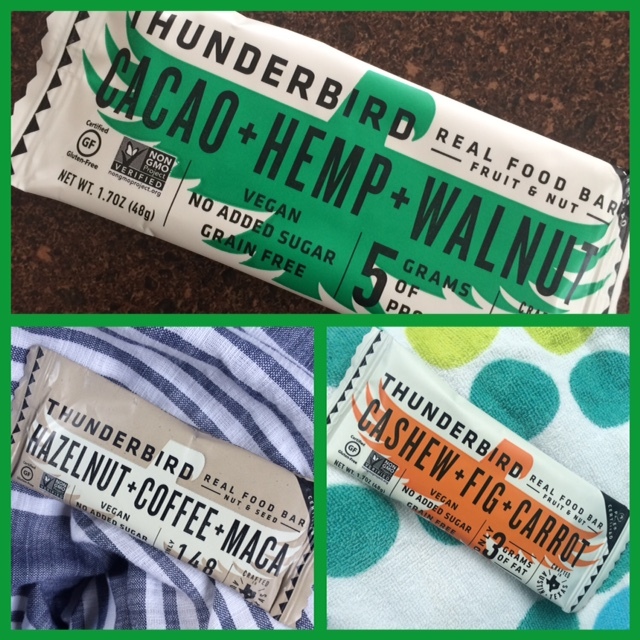 Thunderbird Real Food Bars uses cacao powder and cacao butter instead, giving their Hazelnut Coffee Maca bar a fantastic chocolate mocha flavor without the mess and artificial sweeteners. This bar also had real fair trade coffee beans in it…YUM. For those of you that are into nutrition labels and categorizing food, Thunderbird Real Food Bars are certified gluten free, vegan, paleo, soy and grain free, and non-GMO. I have to admit, with all those labels I was a bit skeptical of this company, wondering if they were actually making good food, or trying to sell “health food” to people who like to hop onto that clean eating train. After tasting so many flavor bars, I can honestly say that this is GOOD food. Personally, I believe in balance. You can eat all the gluten free paleo no added sugar stuff you want because you think it’s “healthy”, but if it’s not even tasty, why bother? So you can feel better about yourself? Food is food people. If it’s not good, don’t make yourself eat it just because it’s “healthy” or “clean”. But, for those of you that do walk that line, Thunderbird Real Food Bars are delicious and nutritious, even for the pickiest health food junkie. Maybe I especially loved these bars because I tend to gravitate towards the fruity flavored bars. I can’t tell you the last time I bought a bar that was “cookie dough”, “double chocolate”, “peanut butter cup”, “vanilla cupcake” flavored. Give me all the fruits! And…BALANCE. Go for a REAL peanut butter cup or cupcake. I promise you the real thing is better than a fake version trying to lure your tastebuds. As far as my top favorite Thunderbird Real Food Bars, they are as follows: Cherry Walnut Cinnamon, Lemon Cashew Apricot, Cashew Fig Carrot, Hazelnut Coffee Maca, Pineapple Mango Papaya, and Almond Apricot Vanilla. Guys, I don’t even LIKE cashews, walnuts, or apricots plain! But mix them with some pure, yummy fruits and seeds and I’m all in. Can’t find these bars at a store near you? Thunderbird Real Food Bars has a website where you can order them. AND, if you use the code BMR15, you will get 15% off your order until the end of September. Shipping is free on orders over $100. The company also offers a subscription service for bar delivery that gets you a 10% discount on all orders. It’s like subscribing to a magazine to be delivered every month…only this is way better because you can choose to have bars delivered to you doorstep every month, two months, or three months. Winning. I’m hoping to get my hands on more Thunderbird Real Food Bars in the future, and crossing my fingers that stores in my area discover these tasty snacks and start selling them! Questions about Thunderbird? Click on their website here: http://www.thunderbirdbar.com/ or shoot me an email or message on my Facebook page. Also, make sure to follow @thunderbirdbar on Instagram for news and occasional giveaways. Happy snacking! My favorite bar and my favorite beast!